ASME B16.11 is the standard for the forged steel fittings, including socket weld and threaded type. Material including carbon steel, alloy steel and stainless steel. Also described as Class 2000, 3000, 6000 threaded end fittings and Class 3000, 6000, and 9000 for socket weld end fittings. ASME B16 standard includes the pipes and fittings material in cast iron, cast bronze, wrought copper and steel. ASME B16.11 (covered by ASME B16), it is used in connecting with equipment in other volumes of ASM B16 series. Forged steel fittings named by their manufacturing processes forging, which to heat the carbon or alloy steel in a transforming temperature and modes the heated parts into the desired shape. Then use machining process to make a forged steel fittings. 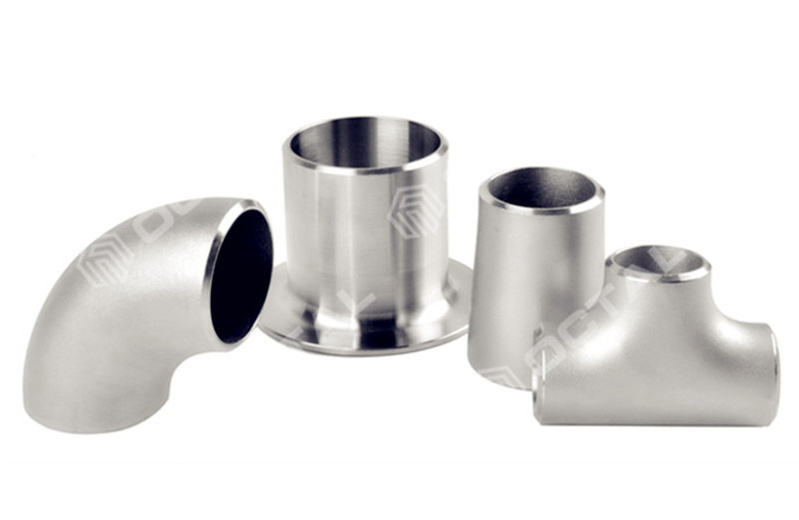 Forged pipe fittings is in high quality which with higher strength and could bear high pressure. 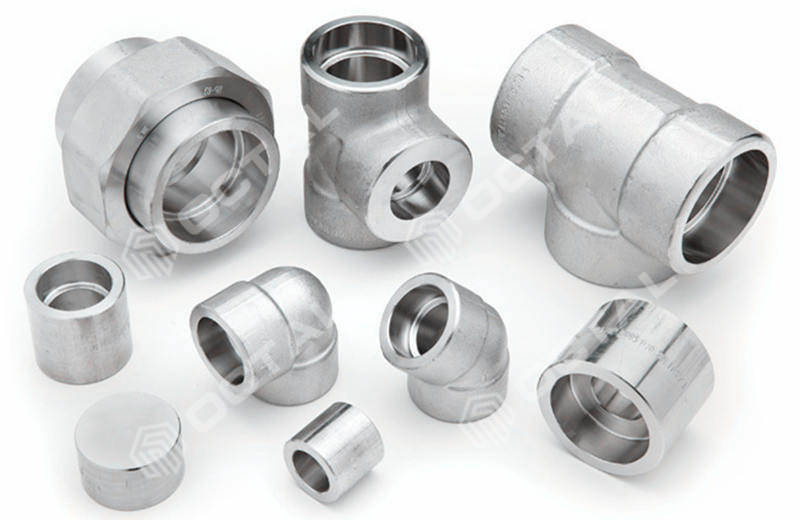 To this fittings you should pay attention to have a uniform wall thickness since they have to be through threading process or machined to socket weld end. This standard contains pressure-temperature ratings, dimensions, tolerances, markings and material requirements for forged and threaded forged fittings. The relevant contents will be shown in below tables in this article. Including socket weld fittings and threaded fittings size in NPS inch. For example the 45 and 90 degree elbow, its size range is 1/2” to 4”, and the classes of the product are ranging in 3000, 6000 and 9000 lbs. Notes: Plug and bushings are not identified by class designation. They may be used for ratings up to Class 600 designation. Pipe fittings with special threads or special flares can be manufactured upon negotiation between the supplier and the buyer. These fittings shall be considered to be in particular conformity to the standard if they are properly marked (see Chapter 4 in ASME B16.11) and comply with all other provisions of this standard. Installation welding requirements are outside the scope of this standard. Installation welding shall be in accordance with the applicable piping code or the operating procedures of the piping system in which the fitting is installed. The standard measurement unit for linear dimensions is inches. Values in millimeters are only for reference . 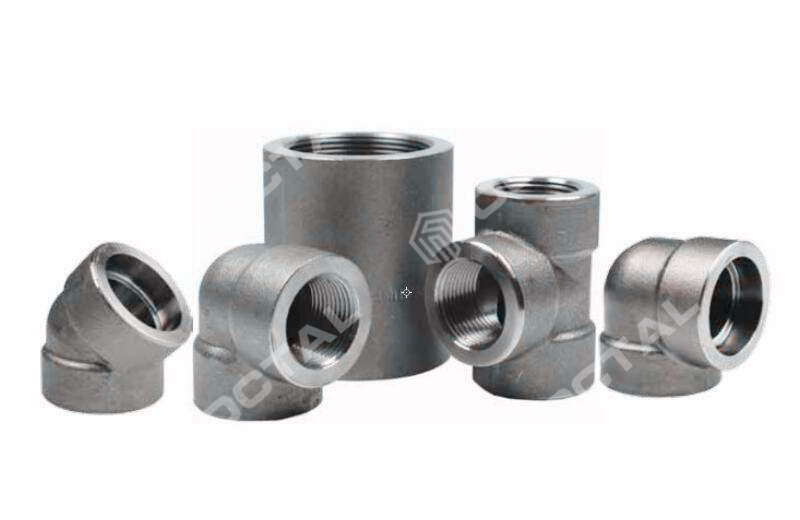 These fittings are designated as Class 2000, 3000, and 6000 for threaded end fittings and Class 3000, 6000, and 9000 for socket-weld end fittings. 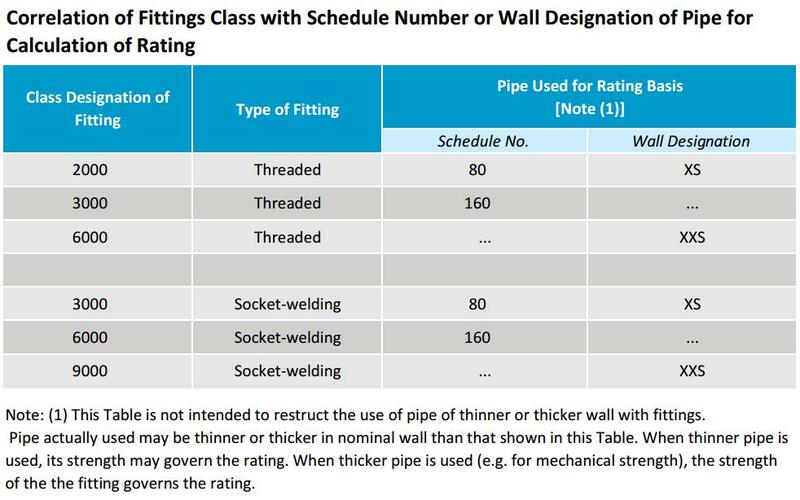 The schedule of pipe corresponding to each Class designation of fittings for rating purposes is shown in below table. Design temperature and other service condition shall be limited as provided by the applicable piping code or regulation for the material of construction of the fitting. With these limits, it defines the minimum pipe wall thickness. Typically 12.5%, minimum wall thickness shall not less than this value. Since ANSI/ASME B36.10 M does not include pipe wall thickness series 160 (SCH160) nor extra strong thicknesses for NPS 1/8, NPS 1/4 and NPS 3/8, the value listed in below table can be used as the nominal wall thickness of the pipe when determining the rating. Pipe fittings composed of socket welding and threaded ends shall be graded according to the shape of the end with a minimum rating from table 1. This standard does not require a pressure test, but the fittings shall be able to withstand the hydrostatic test pressure required by the applicable pipe code to accommodate seamless pipe of material equivalent to the fittings forging and of the schedule or wall thickness associated with the fittings grade and end connection of table 2. The specification code for the fitting is the nominal diameter of thread or socket weld connection. NPS, followed by a dimensionless number, is the designation for nominal fitting size. NPS is related to the reference nominal diameter, DN, used in international standard. For reducing tee and cross, the largest run opening should be given first, followed by the opening size at the opposite end. If the pipe fitting is a tee, the branch pipe size is given last. If the pipe fitting is a cross, the third dimension shall be the largest pipe opening, and then its relative opening specification. Each fitting shall be permanently marked with the required identification by raised lettering and / or stamping, electro-etching, or vibro-tool marking on the collar portion, raised pad, or raised boss portion of the forging. Cylindrical fittings shall be marked on the O.D. or end of the fitting in a location such that the marking will not be obliterated as a result of welding installation. The marking of bushing and plugs is not required by this standard. Materials shall be in accordance with applicable ASME pipe fittings A234, A403, A420 or B366, or other applicable ASME forgings specifications A105, A182, A350, B160, B164 or ASME/ANSI B16.34 Table 1 (see section 5.1). The fittings in Section 1.1.1 shall be marked in accordance with the ASME Pipe Fitting Specification (eg "WP_") or the symbol "B16" to indicate compliance with this standard. Replaceable fittings marked with ASME forging marks (A105, A182, A350, etc.) in Section 1.1.2 shall not be marked B16. Replaceable fittings marked with ASME fittings (A234, A403, A420, and B366) in Section 1.1.2 shall be marked with the serial number of the ASTM specification applicable to special or non-standard fittings. According to the applicable situation, it can be divided into 2000, 3000, 6000 or 9000. Alternatives the designation 2M, 3M, 6M or 9M may also be used depending on the application, where M is 1000. Forgings, bars, seamless pipe or tubes can be used to make pipe fittings. These material shall comply with the smelting, process, chemical composition and mechanical properties requirements for the WP seamless construction materials of ASTM Fitting Specifications A234, A403, A420, A815, or B366 or ASTM Forging Specification A105, A182, A350, B462, or B564. According to this standard, non-standard pipe fittings manufactured from other materials shall be marked in accordance with the agreement between the manufacturer and the purchaser, but the marking should not include the identification markings specified in 4.1.1(b) and 4.1.1(c) of this standard. For all sizes of fittings, the concentricity tolerances of the socket and fitting orifices should be within 0.03 inches (0.8 mm). The concentricity tolerance of the opposing sockets should be within 0.06 inches (1.6 mm). The maximum allowable variation in the alignment of the fitting bore and socket bore axes shall be 1 mm in 200 mm (0.06 in.in 1ft). The maximum allowable variation in alignment of threads shall be 1 mm in 200 mm (0.06 in.in 1ft). Material standard ASTM A234, ASTM A403, A420 dimensions up to 4 inch.